Raspberry Pi and Arduino are probably the most significant symbols of the Maker Movement. They are, without a doubt, the electronics hardware which boosted and triggered the Maker Movement that is changing the world! Both initiatives were aiming to make electronic devices popular and were planned as teaching tools, especially for programming and basic electronics skills. Due to their success in the academic realm, they have rapidly become a worldwide phenomenon and giant communities based on a sharing philosophy have developed an ecosystem around these boards. These products transcended the teaching area and were quickly incorporated into industry. However, they are not rugged enough for many environments in industry, and are therefore facing challenges in more demanding applications. Limitations such as working temperature, lifecycle, supply chain, vibration resistance, pin-compatibility, form factor, licenses and many more inhibit the use of Raspberry Pi and Arduino in professional and industrial equipment. The importance of this kind of hardware in preliminary phases of an embedded system design is undeniable. 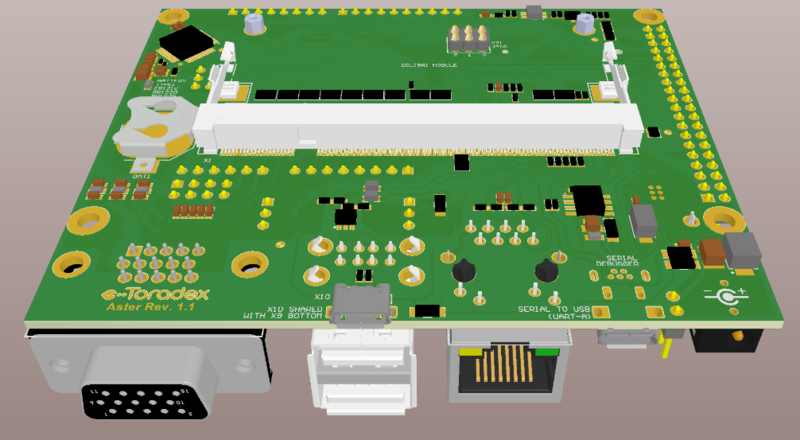 Engineering teams all over the world use these Maker platforms and respective add-on peripheral boards and Shields ecosystems to create a proof of concept (PoC) and to get prototypes done faster. Once the project or the idea is validated, then many companies need more reliable and professional platforms which fulfill the industry requirements. 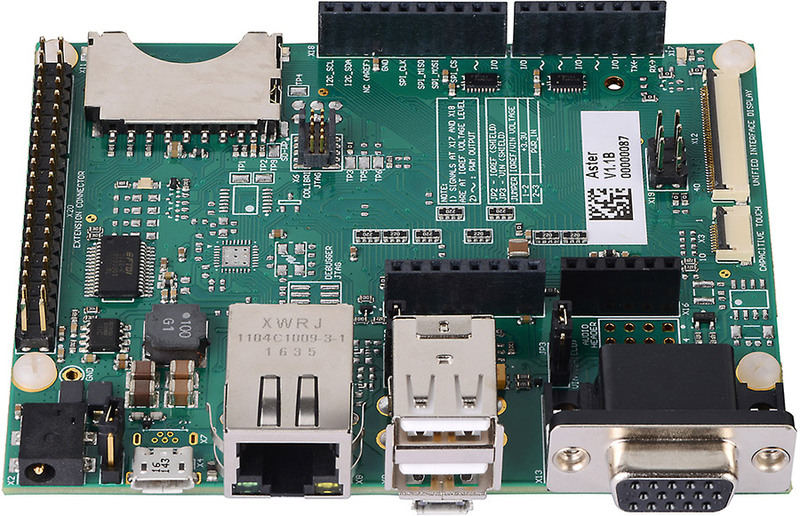 One of the great advantages of using this board is to enable the professional equipment developers to benefit from the extensive Arduino and Raspberry Pi ecosystem of shields and compatible boards to develop proof of concept and prototypes in a reliable industrial platform for their final application. Once you choose to get started with Aster Carrier Board, you get a complete, scalable and reliable Arm Colibri family of System on Modules. 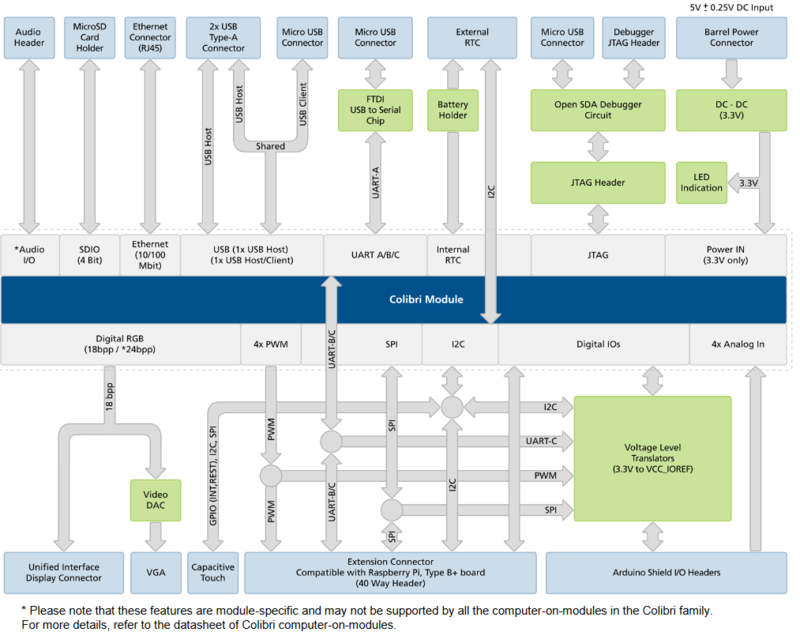 Across the Colibri family, the modules are pin-compatible and based on the well-established application processors of NXP (i.MX 6, i.MX 7, Vybrid) and NVIDIA (Tegra 2, Tegra 3). The SoMs in the Colibri family have a lifecycle of at least 10 years and new members join the family almost every single year. 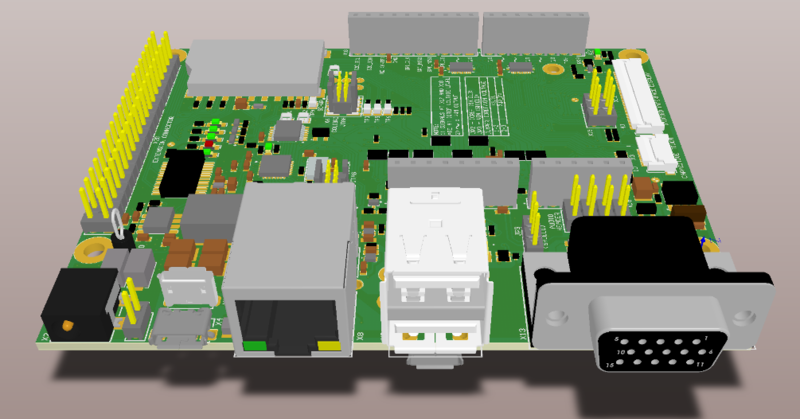 For example, check out the new product release Colibri iMX6ULL, which is pin-compatible with older Colibri revisions. With this update system, your product can virtually have an infinite lifecycle; as soon as you receive a notification that your module will go end-of-life, it is easy to migrate to a newer module with the same pin-outs. Accelerate your next design by buying your own Aster Carrier Board directly from Toradex Webshop.